The Environment Agency is calling on anglers and netsmen to have their say on potential salmon rod and net limitations through an initial consultation launched today (Thursday 24 August 2017). 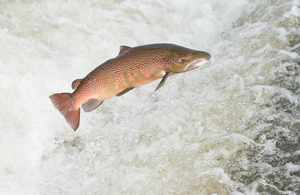 The consultation aims to understand how the Environment Agency can better manage salmon fishing in England and the Border Esk in order to reduce the impact on salmon stocks, which are currently among the lowest on record. It will also look at the impact that any restrictions could have on those whose livelihoods and interests depend on salmon. The initial consultation runs until Monday 9 October 2017 and invites anglers, netsmen, fishery managers and the public to give their views and to help shape the future of salmon stocks in England and the Border Esk. The results will then be used to issue a formal consultation later this year. Salmon stocks across the Atlantic are challenged by a number of factors including marine survival and barriers to migration. The Environment Agency is working with partners on a programme of action to restore salmon stocks throughout England. We are working hard to improve salmon stocks and are seeking views on measures to further protect this important species. The issues facing salmon and the reasons for their decline are complex and there is no simple solution to increasing salmon numbers. Evidence indicates that the marine phase of their lifecycle is the most likely reason for their decline and that fishermen taking salmon is not the primary cause. But if we do not act now, we risk seeing further declines in salmon in many of our rivers. We are asking for views on a range of options and your responses will truly help to form our approach to managing salmon stocks in the future. The Environment Agency, Government, Angling Trust, Rivers Trust, Atlantic Salmon Trust, Salmon and Trout Conservation UK, Wild Trout Trust and Institute of Fisheries Management have formed a working partnership in order to address this issue. This programme is called the Salmon Five Point Approach, and has been jointly developed and committed to by all partners. It sets out the actions to address the key pressures that affect the different life stages of salmon. Find out more about the Salmon Five Point Approach. Take part in the e-consultation. Press enquiries: please call 0203 025 5623, or email newsdesk@environment-agency.gov.uk.